Not to be confused with Captain Toad. 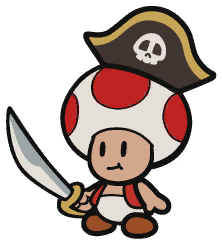 The Toad Captain is a pirate Toad that appears in Paper Mario: Color Splash. He wears a pirate hat and wields a cutlass. He and his crew admire the Legendary Captain, and they own the ship he used to get to Fortune Island. When Mario first enters the Violet Passage, the ship is attacked by Shy Guys, causing the Toad Captain to become stuck out in the colorless sea on a barrel. His crew tells Mario to save him, although Huey says that he and Mario need to collect a blue Big Paint Star to repaint the entire sea. When the blue Big Paint Star repaints the sea, the Toad Captain rides the barrel back to his ship. When Mario returns to the Violet Passage, the Toad Captain thanks him for saving him. He tells them that he and his crew are preparing to voyage to Fortune Island to get treasure, and that the only way to reach the island is by crossing the Lost Sea, which he does not know how to cross. When Mario finds the Journal Entries that explain how to cross the Lost Sea, the Toad Captain tells Mario and Huey that they were written by the Legendary Captain, and that he had been searching for them. He then decides to set sail, though, as there is no wind, the Fan must be used to make the ship move. The Toad Captain begins singing, though he is interrupted by a crew member saying that there is a hole in the ship. When Mario tells the Toad Captain that everything is under control, they set sail again. When they reach the Lost Sea, the Toad Captain teaches Mario how to use the cannons on the ship. When his crew puts up a torn flag on the ship, he tells Mario to take it down or fix it, saying that it makes them look like "thrift-shop pirates." After they make it through the Lost Sea, the ship is blocked by the whirlpool at Vortex Island. The Toad Captain decides to make land at the island, despite Huey wanting to go into the whirlpool to get a Mini Paint Star. On land, he and his crew head over to check out the vortex, though they are blocked by a broken bridge that must be fixed in the parallel world. After Mario stops the vortex, the Toad Captain claims that he stopped it himself by wishing for it to go away. When they leave Vortex Island, they run into a wall of darkness, and they make land on Lighthouse Island to turn the lighthouse on. The Toad Captain has Mario go into the lighthouse before him. When Mario exits the lighthouse after fixing it, the Toad Captain can be found outside, as he had mistaken the Lighthouse Keeper's to be a cry for help. When they go back to the ship, the Toad Captain spots Fortune Island in the distance. When they reach Fortune Island, the Toad Captain becomes nervous. His crew tells him to not give up, and he decides that he should not be scared. When checking out the island, he discovers that the entrance to the cave is blocked by water, and tells Mario to find a way inside. When Mario opens up a second entrance, the Toad Captain tells him to check it out for him, and sets his crew up as a ladder so that Mario has an easier way out of the cave. When the Legendary Captain follows Mario out of the parallel world, he notices the Toad Captain, and they begin talking after the Toad Captain recognizes him to be the Legendary Captain. After Mario successfully defeats Wendy O. Koopa, the Toad Captain learns that the treasure had been claimed long before, and becomes saddened that his journey was for nothing. He is cheered up by the Legendary Captain, who says that he will help the Toad Captain become a legend, and the two leave the room. If Mario returns to Fortune Island, the Toad Captain can be seen training with the Legendary Captain on the beach. They will reveal that the Toad Captain's pirate accent is fake. This page was last edited on October 5, 2017, at 06:46.